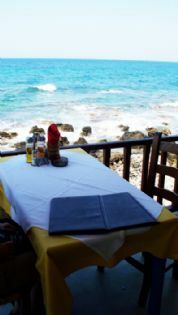 Taverna Agistri is the ideal place for a meal at any time of the day with fantastic views over the sea and harbour at the picturesque village of Sissi. The Agistri is perched on a platform at the sea edge. You can sit outside on the terrace above the sea or inside if you prefer. 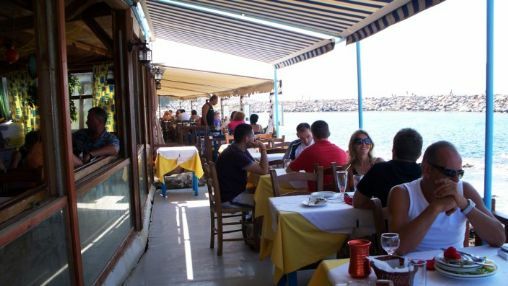 Enjoy dinner while watching the sunset and the local fishing boats as they enter the small pretty harbour or enjoy a cool drink and a snack at any time of day. Specialities include fish and meat dishes. Range of beers and wines. You will always receive a fine welcome from the friendly, helpful staff who treat each of their customers as special guests. Many people return again and again to enjoy the atmosphere and hospitality of this special place. To view the full menu please click here. Prices shown are from 2008 and can fluctuate slightly according to season.